Arjan de Kock has made his annual migration to Europe for their winter and kicked things off by sending "Kheops" 8B, a project from last year in Fontainebleau. Andrew Pedley returned home from a few months in the jungle and wasted no time getting back to action with a fast ascent of "Anduril" 30/31 at Chosspile. Later in Oudtshoorn, he sent "Mr Incredible" 31, onsighted "Hardplay" 28 and flashed "Going Going Gone" 29. A handful of South African climbers (James Smith, Brian Weaver, Marijus Šmigelskis, Andrew Porter, Paul Bruyere and Dave Tapp) were invited by the Nigerian government to compete in a climbing competition at the MARE Festival on the granite domes of Idanre. Although the competition turned out to be more for demonstration of what climbing is about than an actual fair contest, it lay the foundation for future climbers to come visit the fruitful area with a lot of potential for mid to big wall climbing on fairly good rock. Check out Brian's report here, and Andrew's here. A bunch of climbers spent New Years in Montagu. Marijus Šmigelskis was among them and he managed to get the second known ascent of "Duende" 32 on his second attempt. Matt Bush has been spending a fair amount of time at the granite boulders of Llandudno and was well rewarded with the first ascent of "The Love Project" 8B. 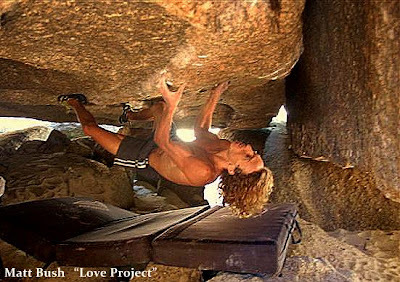 The line climbs out a cave via a series of compression moves on slopers and crimps.